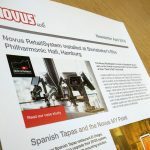 For the last 75 years, Novus have been developing workplace solutions to make working environments more efficient. 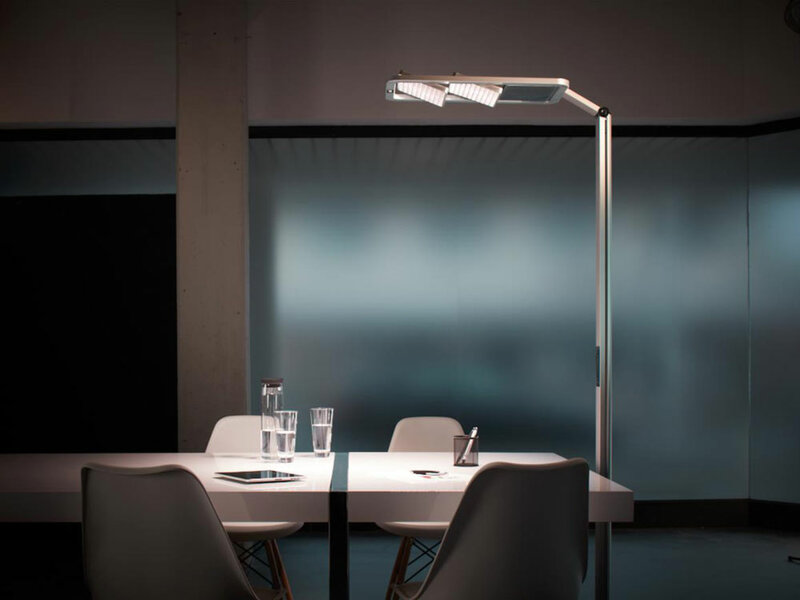 So lighting your workspace has been top of the list for product development. 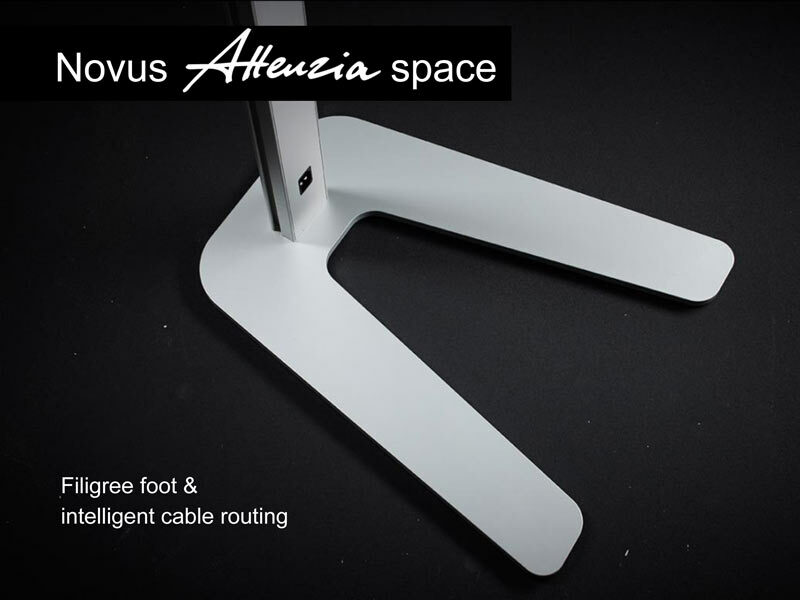 With the aim being to increase efficiency and well-being, last year, Novus launched the new Attenzia task lighting range. The high quality sleek and stylish lighting solution proved an instant hit with options for mounting the task light including the desk stand. 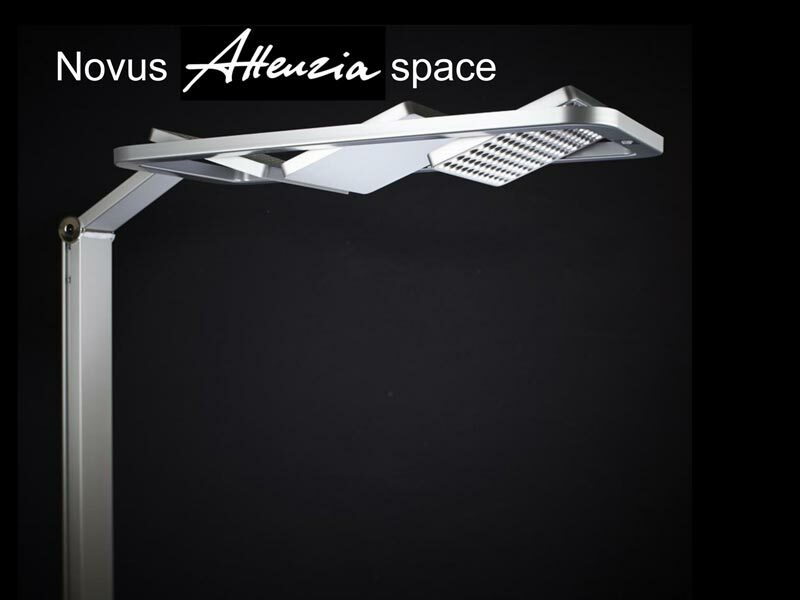 So this year, we are delighted to announce the launch an addition to the Attenzia range, Introducing the new Attenzia Space lighting range from Novus. The Attenzia Space is a high quality aluminium finished floor standing lamp range with top performance specifications. 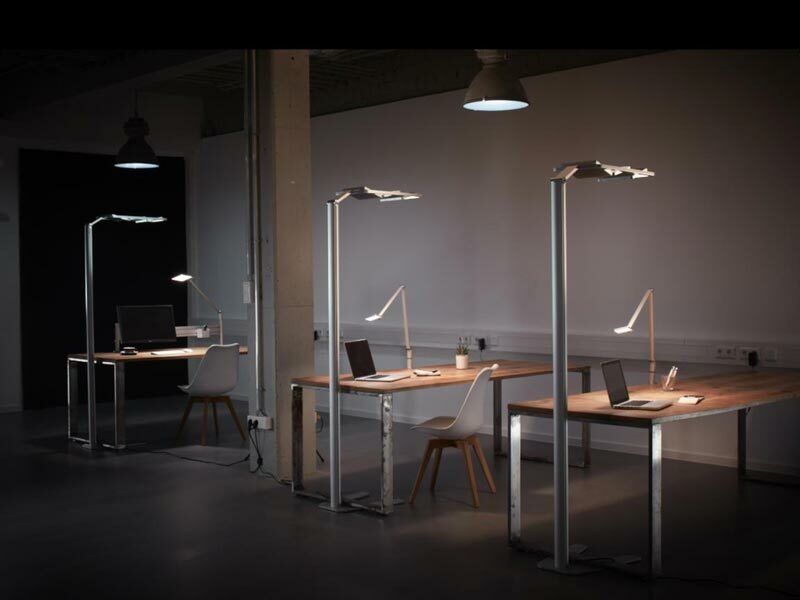 It is not just a task lamp but will illuminate your desk space efficiently in the place of room luminaires. In large open plan offices or workspaces which are constantly changing, the Attenzia Space can provide amble illumination without the need for overhead lighting…your lighting travels with you, avoiding the expense of relocating lighting panels. 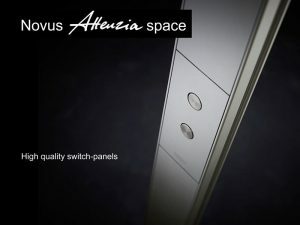 The unique feature of the Attenzia Space range are the LED panels. Not only are they sleek and stylish, but the three panels rotate up to 270 degrees. This means, that lighting can be directed onto the desk surface as well as overhead, creating unique flexibility with each panel. The grid-designed lamp head offers the very best in German Engineering, with deep light cones which provide optimal glare protection too. Intelligent cable routing is provided internally, so goodbye to unsightly trailing cables. The low profiled floor stand is designed to fit neatly under desks and tables, without becoming a trip hazard. 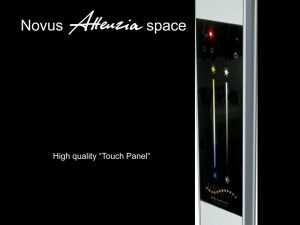 The Attenzia Space is available in four models, and in the colour silver, with black and white finishes coming soon. The Attenzia Space Active HCL gives the perfect lighting, mimicking natural daylight. Lighting is achieved from the top of the lamp, providing a spectrum of natural light to promote wellbeing and tune into your body clock. With deep light cones of warm white and cold white, “tuneable” lighting from 2,700-6,500K can be achieved. Wherever there is not enough daylight, the HCL model will take over from the sun. In the morning, the lamp will provide cool, white, energising light. Towards the end of the day, a warm white takes over promoting relaxation as you descend towards sleep. Research has found that HCL lighting can improve your well-being and focus, providing better sleep/wake routines, a better night’s sleep, improved concentration, alertness and more energy. On three of the models (excludes the Attenzia Space model), presence and lighting sensors are provided within the lighting head. The presence sensor detects whether a person is in the vicinity and will adjust its lighting levels accordingly. After 20 minutes, the lighting level dims to 10% and then switch off automatically after 21 minutes. A lighting sensor will automatically switch off after 10 minutes if lighting levels are over 150% of the set point, or will switch on automatically if going 100% below the set point. Each LED panel can be separately dimmed on the HCL and XT models. All models are provided with a high quality control panel, found on the upright of the lamp. The HCL model has a touch panel display whilst the other models have buttons for on/off/dimming. 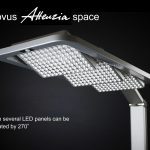 Tests have concluded that the Attenzia Space range provide an energy efficient option for your lighting, giving up to 90W of consumption at its highest, yet providing lighting where it is needed and avoiding unnecessary space being lit. Parent company Thinking Space Systems will be demonstrating the Attenzia Space Active HCL lamp at this years’ IFSEC International Exhibition. Held from the 19th to the 21st June at London ExCel, the lamp will be incorporated into a control room console at their stand E15. For further information, including specification, pricing and availability, please get in touch with us or download our brochure.